It's a lovely, bright morning and Lulu is just waking up. There's a noise outside her window . 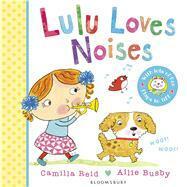 . .
Join Lulu as she listens to her favourite noises - and has lots of fun along the way! From the tweeting birds to the ding-a-ling of Lulu's tricycle, little ones will love picking out familiar sounds in this brilliantly interactive book. With a flap to lift on every spread, these perfectly-sized board books with rounded corners are just-right for little hands. Collect all four in the Lulu Loves series - including Colours (781408849644), Noises (9781408849637), Numbers (9781408849576) and Shapes (9781408849583). Camilla Reid has worked in the publishing industry for over 17 years. Having two children of her own, she is well-tuned into what works for little ones. Camilla lives in London. Ailie Busby has been illustrating books for over 15 years, including the Jump Up and Join In series (Egmont). Ailie lives in Newcastle. Together, Camilla and Ailie have written and illustrated the brilliant Lulu series, including novelty, board and picture books.